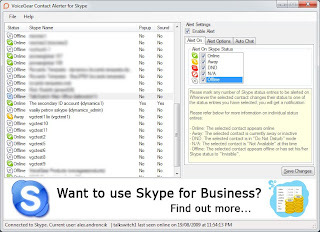 VoiceGear Contact Alerter for Skype is a Skype plugin that allows you to stay informed whenever your Skype contacts change their online status. Using this plugin you can enable custom alerts for every Skype status. Anytime your Skype contact switches status you can be notified with a popup window or a sound alert. · Auto Chat - Simply enable a contact alert for your Skype buddy and type in a chat message. Your chat message will be sent to your contact whenever they switch their Skype status to Online. · Text Popup and Sound Notifications - Choose between text popup and/or sound alerts for status notifications. · Contact Reminders - Set individual contact reminders. · Last Seen Status Info - View the last time your contact was seen online.